Properties in Basse Terre average 4.6 out of 5 stars. 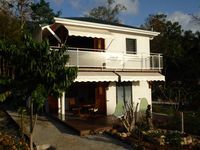 Property 59: Beautiful Creole villa in Petit-Bourg, the center of Guadeloupe. Property 67: Cottage with garden, 2 steps from the sea, for 5 people, fully equipped. Property 91: Nice and authentic. 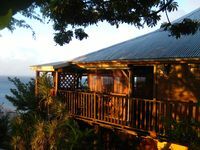 The apartment is ideal for a stay in Guadeloupe. The best parts of the apartment are: 1. Super clean and new 2. walking distance to the most beautiful beach on the whole island. 3. Hosts are super friendly but give you privacy. She prepared us food when we arrived because we got in so late. 4. The front wall can be opened during the day and closed at night for great views 5. The flowers around the apartment are gorgeous I have nothing negative to stay. I would recommend this place to anyone I knew visiting guadeloupe.